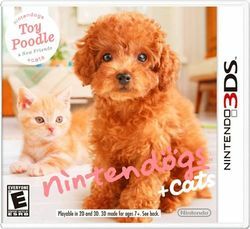 Nintendogs + Cats (ニンテンドッグス＋キャッツ, Nintendoggusu + Kyattsu?) is a real-time pet simulation video game for the Nintendo 3DS. It is a sequel to the Nintendogs games for the Nintendo DS systems. It was announced alongside the 3DS during Nintendo's E3 press conference, and was a launch title, released February 26, 2011 in Japan, March 25, 2011 in Europe and March 27, 2011 in North America, launched earlier in Australia. This page was last edited on 23 January 2014, at 13:40.